Turner Classic Movies released its November schedule online last week. The November Star of the Month is Norma Shearer. This is Shearer's second time as Star of the Month; she was the featured star 16 years ago, in 1999. Over 20 Shearer films will be shown on Tuesday evenings this November. My favorites on the schedule include THEIR OWN DESIRE (1929), THE DIVORCEE (1930), and THE BARRETTS OF WIMPOLE STREET (1934). The November schedule includes a significant number of WWII films, including many focusing on the French Resistance. November themes also include dictators, rain, the South, "good guy" pirates and thieves, and movies with the word "sweet" in the title. November tributes include Ann Rutherford, Gig Young, Wheeler & Woolsey, Powell & Loy, Pat O'Brien, Paul Kelly, Dorothy McGuire, Gene Kelly, Boris Karloff, Dean Stockwell, Ricardo Montalban, Cary Grant, and Tracy & Hepburn. 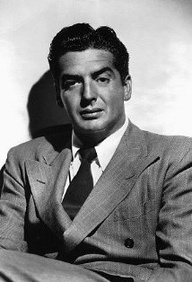 Highlights for me include a day-long birthday celebration for Virginia Mayo and a prime time tribute to Victor Mature. The Mature tribute includes a screening of the 20th Century-Fox film KISS OF DEATH (1947) which also stars the late Coleen Gray. For those who have been tracking the number of "newer" films airing on TCM of late, the number is down from October, when there are roughly three dozen post-1970 films on the schedule. The number of post-1970 titles is down to around 20 in November. I'll have more on the October schedule around the end of September. In the meantime, Summer Under the Stars is currently underway, with Susan Hayward the Star of the Month in September and David Niven being celebrated in October. Update: For more on TCM in November, please visit TCM in November: Highlights and TCM Star of the Month: Norma Shearer. 1999 was 16 years ago? :/ I feel old. Norma is great. Maybe I missed something but there hasn't been a new Norma bio for decades now. Newest thing I can recall is her coverage in the Mick LaSalle pre-Code book. LOL. I like her too! I know of the Quirk and Lambert bios of Shearer, and THE FILMS OF NORMA SHEARER Citadel -- all of which have been out for many years. There were a couple Thalberg bios a few years ago which tangentially covered her. If anyone knows of a recent book revisiting Shearer's life and career, please feel free to contribute it to these comments! I adore Norma Shearer and can't wait for her to be star. As to newer films, I can't stand it. Post 1970 films are shown everywhere. The beauty of TCM is you can see pre-1970s films. I wish at least 1 channel would stick to it's alleged mission. Really nice article Laura. Thanks for getting this info for us!